Sermon-making, like film-making, involves cutting and editing lots of good material that doesn't fit the particular purposes of the given message. There is almost always stuff left on the cutting-room floor. Here is some stuff that didn't make it into Sunday's message (although there were a few echoes of some of this in some of the application). 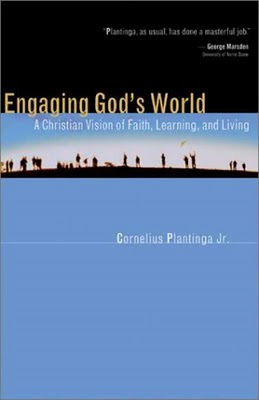 This is from Cornelius Plantinga's excellent book Engaging God's World: A Christian Vision of Faith, Learning and Living. Plantinga discusses three of the big narrative movements in redemptive history - creation, the fall, redemption - gleaning insights throughout for how Christians should engage the world. I'm reading the book as I prepare this series, and am currently about half-way through. In Plantinga's chapter on creation, he proposes eight implications of the Christian doctrine of creation. Most of these are verbatim, but I've lightly edited a couple of them. Of course, these are just the headings. The book includes further exposition of each implication. 1. First, the original goodness of creation implies that all of it, including any human being we meet, is potentially redeemable. 2. Second, created things - and their parts and processes - are unique and sometimes mysterious, but because they have come from the wisdom of God they are also purposive and, in principle, intelligible. 3. Third, God created the heavens and the earth out of his own goodness, power, and love - out of his own enthusiasm for being. 4. Fourth, we should love the natural world without worshiping it. 5. Fifth, in Genesis God affirms the goodness of work and of marriage - the ordinary means of production and reproduction - with the repeated affirmation that "he saw that it was good" or even "very good." 6. Sixth, the declaration "Let us create humankind in our image" implies a range of human responsibilities, including those associated with earthkeeping and creativity. But it also secures a range of human rights, including the right to respect, the right to life, and the right to certain freedoms. 7. Seventh, the fact that individual human beings, and also the holy catholic church, have been created in the image of God implies the need to balance our individual and corporate identities. 8. Eighth, the Christian doctrine of creation places us in the scheme of things. We are not God, but only images of God. On the other hand, we are images of God, and not mere products of natural selection working off random genetic mutation.